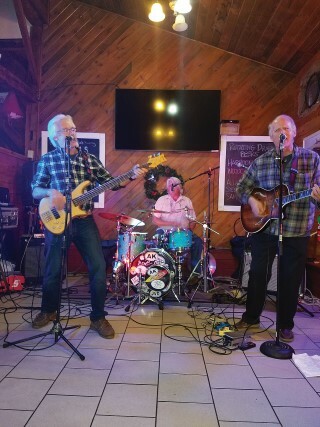 It​ ​was ​ ​the​ ​trio of​ ​Bill​ ​Bennett,​ ​drummer;​ ​Jeremy​ ​Longyear,​ ​bass​ ​guitar​ ​and​ ​Stuart​ ​Tisdale,​ ​lead​ ​guitarist​ ​who performed​ ​on​ ​Friday.​ ​All​ ​three​ ​musicians​ ​contributed to the vocal portions​ ​of ​ ​the​ ​well-known​ ​1960s, 70s​ ​and​ ​80s​ ​songs​ ​and​ ​dance​ ​tunes. As​ ​a​ ​part​ ​of​ ​The​ ​Windham​ ​Eagle’s​ ​music ​ ​ entertainment​ ​series​, we​ stopped by Gilberts ​​to​ ​enjoy​ ​some​ ​favored​ ​songs​​ ​in an​ ​effort​ ​to​ ​highlight​ ​the​ ​arts​ ​in​ ​the Windham and Raymond communities. “You​ ​ know​ ​this​ ​band​ ​has​ ​opened​ ​for​ ​Foreigner​ ​in​ ​Rangeley?” ​stated ​one​ ​of​ ​The​ ​Elmores’​ ​fans, Bob​ ​Ritter, when asked about the band. 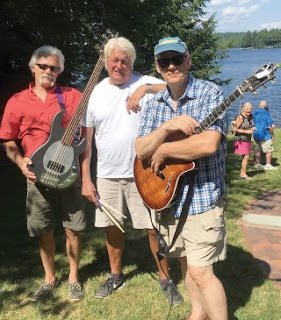 Bennett​ ​lives​ ​on​ ​Little​ ​Sebago​ ​Lake. ​​He​ ​is ​ ​now​ ​retired​ ​from​ ​his​ ​position​ ​as​ ​President​ ​of​ ​Oakhurst Dairy ​ ​in​ ​Portland, which​ ​was​ ​owned​ ​by​ ​his​ ​family​ ​for​ ​over​ ​90 ​ ​years​ ​before​ ​they​ ​sold​ ​the business. Tisdale ​ ​working​ ​as​ ​a​ ​​ ​high​ ​school​ ​teacher​ ​in​ ​Portland​ ​and ​ ​Longyear​ ​as​ ​an​ ​owner​ ​and operator​ ​of​ ​an​ ​automotive​ ​repair​ ​ shop,​ ​also​ ​in​ ​Portland. But​ ​then​ ​adult​ ​life​ ​took​ ​over​ ​with​ ​college, ​​raising​ ​ a​ ​family​ ​and​ ​work. ​​“We​ ​took​ ​a​ ​25-year​ ​hiatus and​ ​got​ ​back​ ​ together​ ​again​ ​after​ ​raising​ ​families​ ​and​ ​going​ ​to​ ​school,” ​​Bennett​ ​ explained. In​ ​addition​ ​to​ ​Bennett,​ ​Longyear​ ​and​ ​Tisdale, the​ ​Trio​ ​group​ ​becomes​ ​the​ ​Elmore​ ​Twist​ ​Band when​ ​friends ​ ​Jimmy​ ​Austin​ and Ross Thompson join them. Austin ​lives​ ​in​ ​Rumford and is​ ​a​ ​classically​ ​trained musician​ ​who​ ​has performed​ ​with​ ​the​ ​band​, ​Toto. Thompson is a ​life long friend​ ​and​ ​lead​ ​singer who ​lives Stratton. If you missed the entertainment provide by The Elmores, this time around, be sure to mark your calendars for Friday, January 12. They will be at Gilbert’s to perform once again. To​ ​book​ ​The​ ​Elmores​,​ ​contact​ ​Bennett​ ​by ​ ​email​ ​at​ ​​wpbelmore@gmail.com​​ ​or​ ​through​ ​their Facebook page.